More states logged double-digit unemployment rates in February, with North Carolina and Rhode Island seeing their rates hit record highs. The U.S. Labor Department's report, released Friday, showed the terrible toll the recession, now in its second year, is having on workers and companies alike. Seven states have unemployment rates that topped 10 percent last month. That's up from four states in January. The U.S. unemployment rate, released earlier this month, rose to 8.1 percent in February, the highest in more than 25 years. Economists predict the national jobless rate will hit 10 percent by year end even if the recession were to end later this year as some hope. Michigan's jobless rate climbed to 12 percent, the highest in the country. South Carolina registered the second-highest at 11 percent and Oregon came in third at 10.8 percent. North Carolina came in fourth with an unemployment rate of 10.7 percent, the highest there on records dating back to 1976. California and Rhode Island tied for fifth place at 10.5 percent each. That was an all-time high for Rhode Island. The seventh state with a jobless rate above 10 percent was Nevada at 10.1 percent. All told, 49 states and the District of Columbia saw their unemployment rates move higher in February from the previous month. Only Nebraska recorded a slight drop. 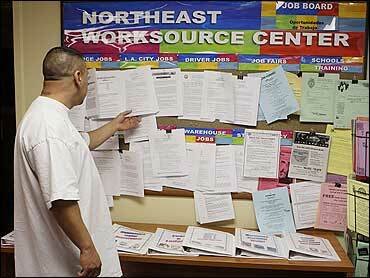 Its jobless rate dipped to 4.2 percent. Wyoming once again had the lowest unemployment rate, 3.9 percent. On Thursday, the Labor Department reported that the overall number of Americans receiving jobless benefits rose to 5.56 million in the last week, significantly higher than analysts' projections of 5.48 million and the highest on records dating back to 1967. First-time claims for unemployment insurance rose to a seasonally adjusted 652,000 from the previous week's revised figure of 644,000, slightly higher than analysts expected. A year ago, the number stood at 367,000.